When you work with Reiloy Westland Corporation, you not only get a great product; you get a great company! Reiloy USA had the pleasure of celebrating Teresa Holst’s 40th Anniversary with the company. Teresa has held numerous positions in the company during those 40 years ... actually starting out in a tool crib. There is no question that Teresa holds a special place in all of our hearts. Currently she is the Accounting & Human Resources Manager. Teresa was presented with an etched crystal vase, flowers and a check. Thank you Teresa!! Pictured with Teresa are from left to right George Radcliff, VP of Sales & Marketing; Joe Piccini, President; Wayne Hook, VP of Operations; and Kevin Mayer, VP of Finance for Reiloy USA. 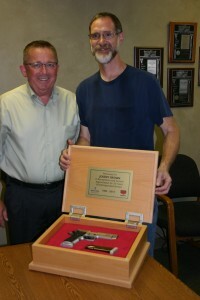 Reiloy USA celebrated the 20th Anniversary of Robert Johnson’s employment with the company. Robert was awarded a plaque and check for this accomplishment. Robert is a CNC Machinist on the barrel side. Twenty years experience equates to a quality product ... what Reiloy USA customers have come to expect. Thank you Robert! 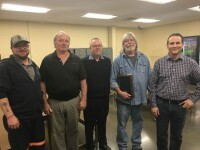 Pictured with Robert from leflt to right are David Larson, Barrel Supervisor; Gary Larson, Manufacturing Manager; Wayne Hook, VP of Operations; Robert Johnson; and Joe Piccini, President of Reiloy USA. 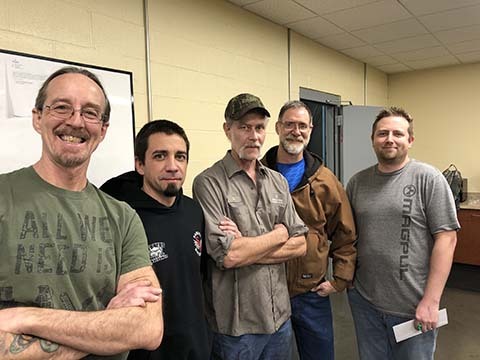 Reiloy USA recently recognized five employees for perfect attendance during 2018. 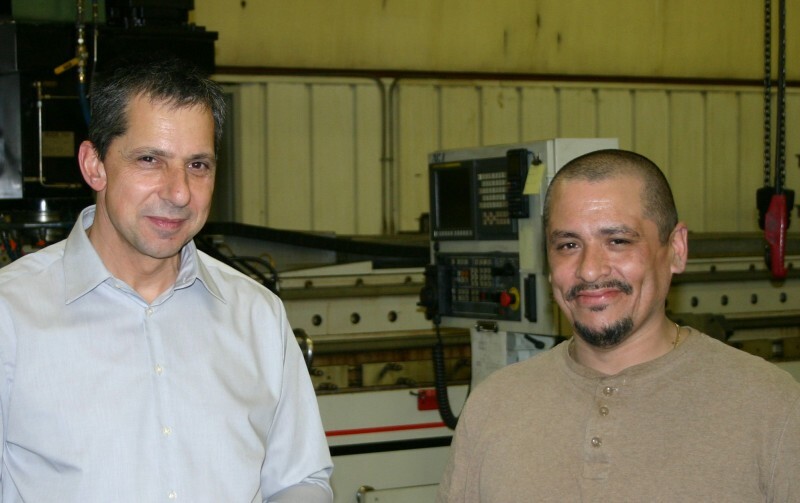 The Reiloy USA employees truly make the difference in the quality screws and barrels manufactured for our customers. This achievement further verifies that commitment to being the best and producing the best! Pictured from left to right are: Charles Girrens, David Steinbach, Tom Kramer, Jeremy Brown, and Seth Alderson. The University of Kansas Formula SAE racing team for the 2018-2019 season dropped by to show the employees of Reiloy USA their cars for this year’s racing season. Reiloy USA was proud to be able to assist in the building of these cars by manufacturing some items for them. 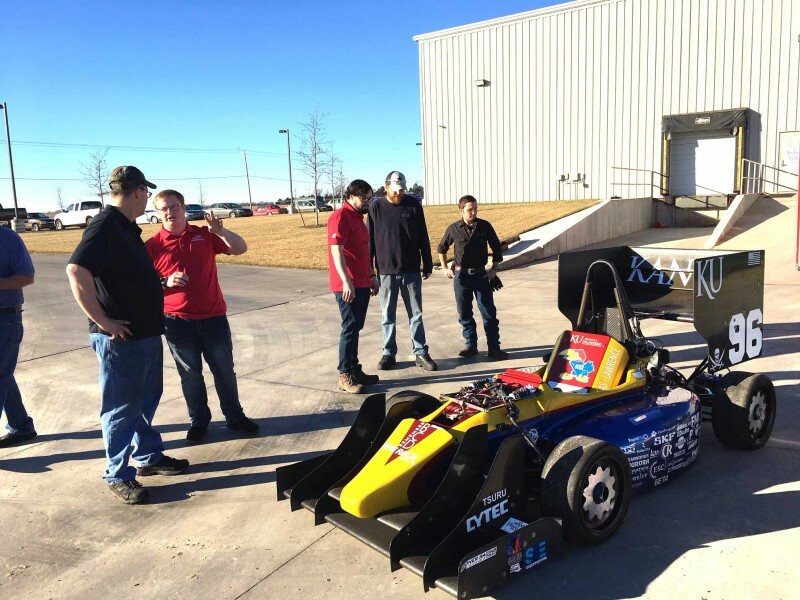 Jayhawk Motorsports is one of the leading contenders in the Formula SAE competitions. Jayhawk Motorsports was founded in 1994 by a group of six KU mechanical engineers. Since then, JMS has grown into developing two vehicles, one electric and one combustion. The team is comprised of over 40 students. Team members represent several disciplines including industrial design, business, computer science and mechanical, chemical, and electrical engineering. 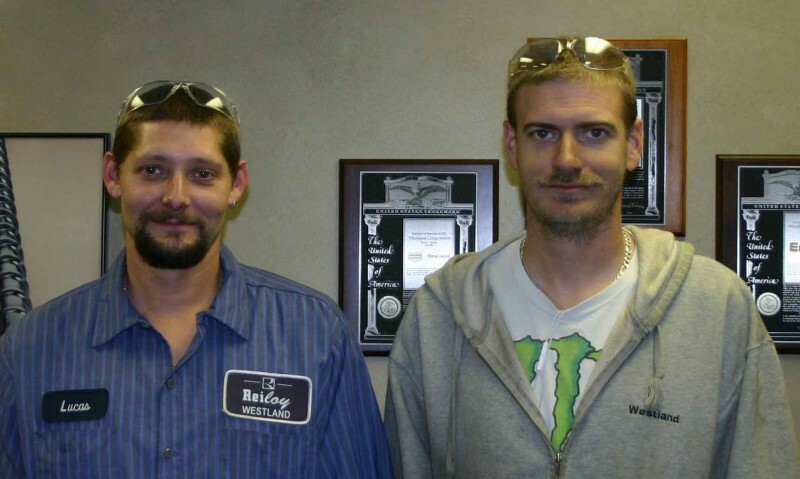 Pictured are two of the Kansas University students visiting with Reiloy USA employees about the race cars. The Reiloy USA 2018 family picnic was a huge success. Everyone enjoyed the day that included horseshoes, bingo, petting zoo, face painting, photo booth, special prize drawings and, of course, delicious food. Plus every employee left with a truly exception gift provided by the generous donations of our vendors. This event is anticipated every year and a way for the great employees of Reiloy USA to have fun outside of the work environment. This year we were especially honored to have in attendance (from their home in Troisdorf, Germany) Mr. Bernd Reifenhäuser, CEO of our parent company – The Reifenhäuser Gruppe, and Mr. Uwe Gaedike, Managing Director of Reifenhäuser Reiloy. 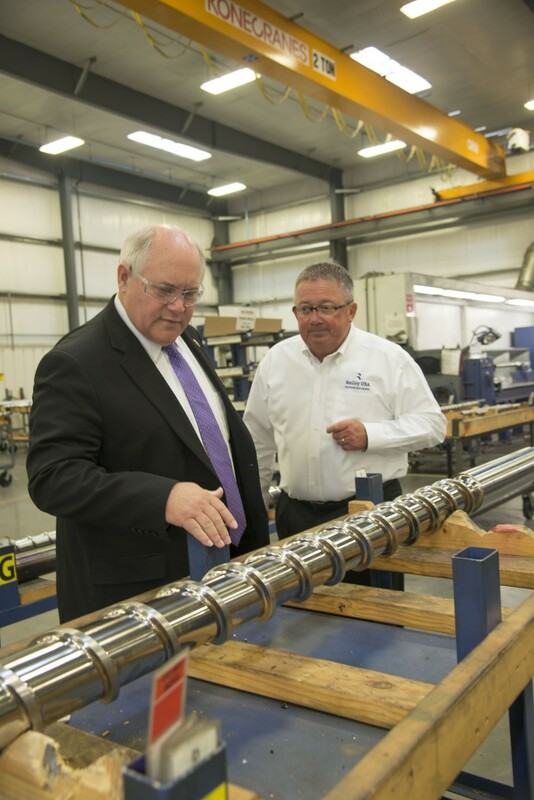 Reiloy USA was recently honored to have our Representative for the 4th District of Kansas, Congressman Ron Estes, visit our facility. After a short introduction about our company and the components we produce for the plastics industry, he and his associates went on a tour of Reiloy USA’s manufacturing operation. He was interested in the success Reiloy USA has experienced and the challenges we face competing in a global market. We do appreciate the job Congressman Estes is doing in Washington DC. 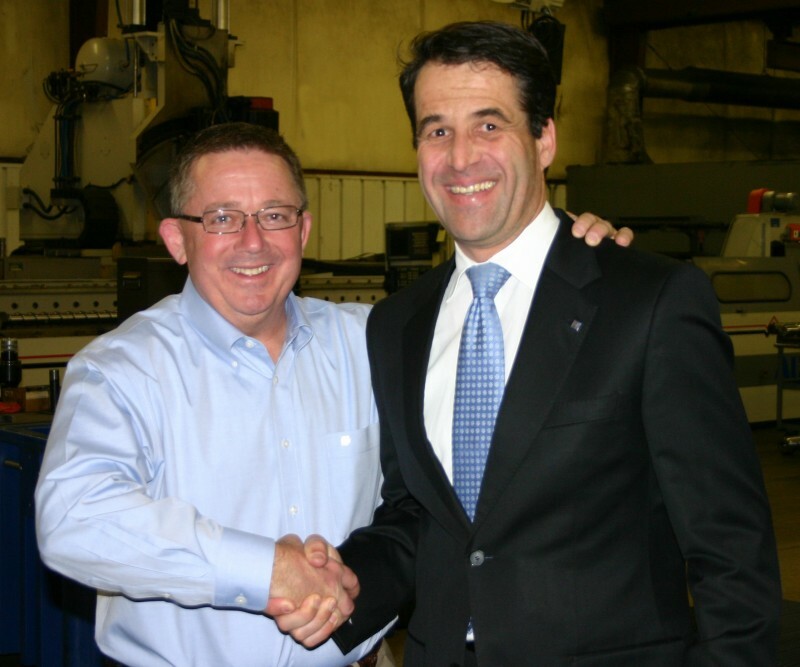 Thank you for taking the time to visit Reiloy USA! 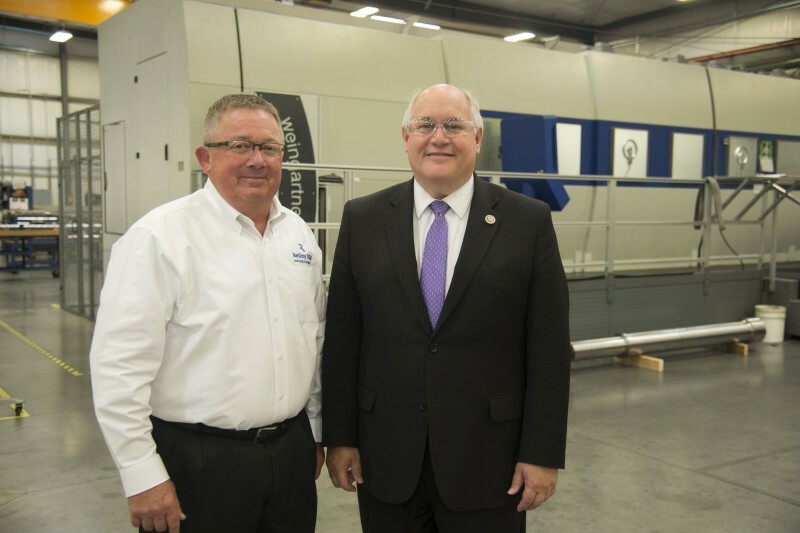 In the pictures with the Congressman is Dave Larson, President of Reiloy USA. Reiloy USA recently celebrated Mike Reinbold’s retirement. Mike has been the head of our maintenance department for several years. He was especially busy during the time Reiloy USA moved to our new facility. Thank you for your hard work and commitment Mike. We wish you many happy retirement years. 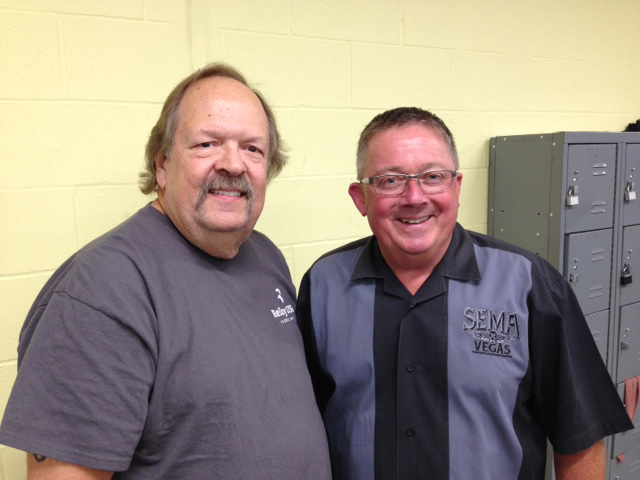 Mike is shown on the left with Dave Larson, Reiloy USA’s President on the right. 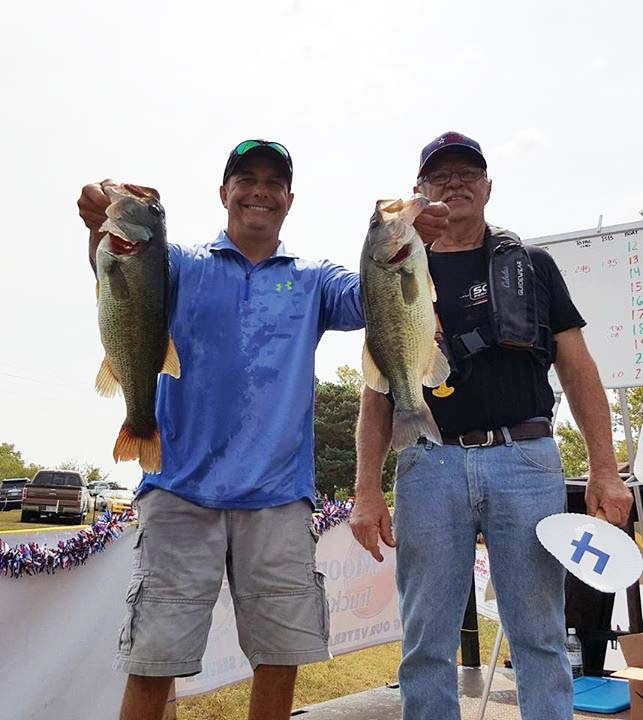 Vinton Brown, a Reiloy USA CNC Machinist for 30 years and counting, recently participated in H3 America’s Fishing Tournament. H3 (Heroes Helping Heroes) America is dedicated to supporting the men and women who defended our freedoms. Their mission is to help add to the quality of life that each of these veterans deserve. Each fishing team consisted of a volunteer paired with a veteran. Vinton and Gary Starr (his team mate and veteran) won the tournament. Plus Vinton earned the “big fish” award. We are proud of Vinton’s contribution to this very worthy organization. To learn more about H3 visit www.h3america.com. Reiloy USA had the privilege of awarding A.J. Peterson a watch for his 10th anniversary with the company. A.J. is a one of our proficient polishers. His 10 years of experience really is an asset in providing our customers with high performance, high quality screws and barrels. Thank you for your efforts A.J. A.J. 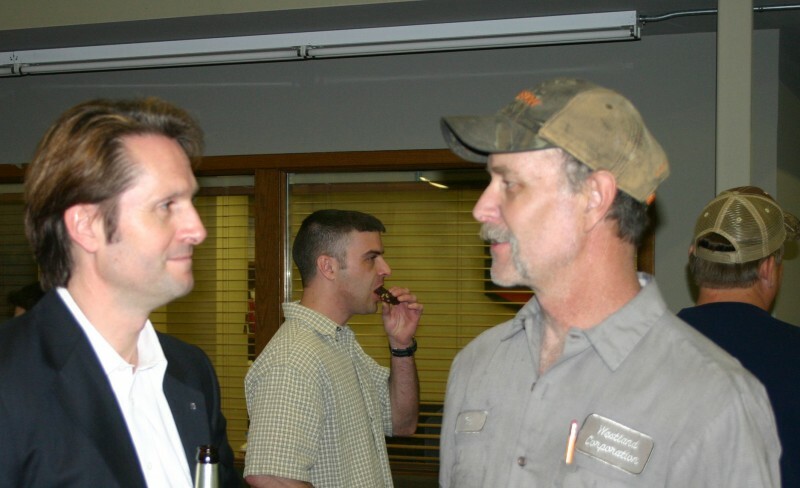 is shown on the left in the photo above, being congratulated by Reiloy USA President, Dave Larson. Reiloy USA was the host of a tour and meeting of the Wichita Manufacturer’s Association. 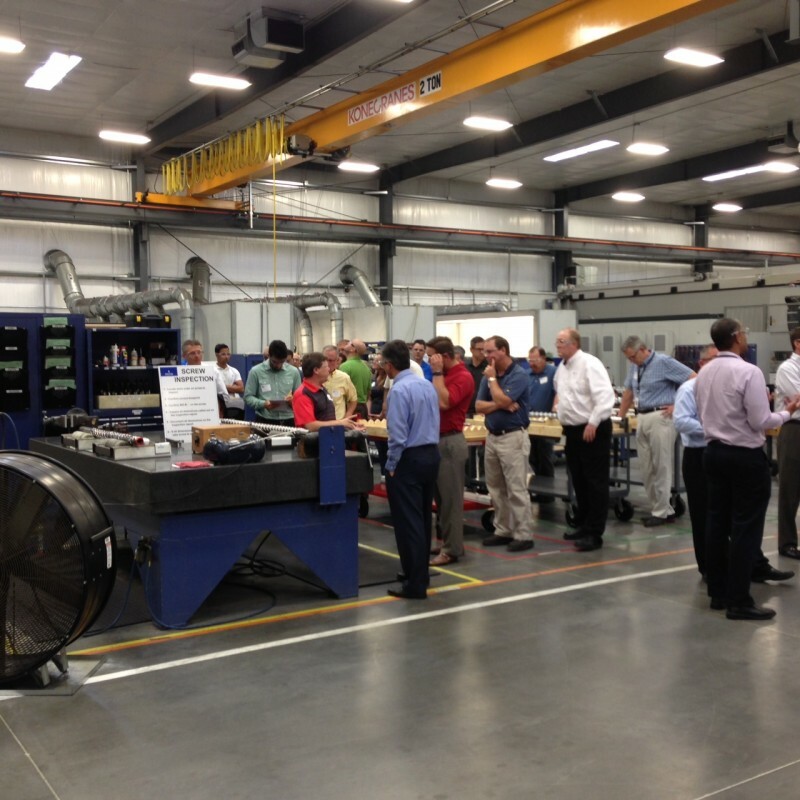 Approximately 80 people attended and toured our new facility. Each tour was conducted by an employee of Reiloy USA. The Wichita Manufacturer’s Association is an organization of management personnel and manufacturing companies in the Wichita, Kansas metropolitan area. They have been supporting Wichita for more than 90 years. Reiloy USA was honored to have the opportunity to tell more local people about our company. Reiloy USA recently recognized Wayne Hook for his 30 years of significant contribution to the continued success of Reiloy USA. Wayne is our IT & Engineering Director. Obviously he was just a teenager when he started here, sweeping the floors for some extra cash. We value and appreciate Wayne’s commitment to a well-run organization. Congratulations Wayne. Pictured are Teresa Holst, Wayne Hook, Charles Girrens, and Jeremy Brown. Each has worked for Reiloy USA 30 or more years. Reiloy USA recently made a monetary contribution to an area high school. One of the teachers has implemented a “standing classroom”, using media carts for desks. The class is 90 minutes long so the request went out for donations to purchase anti-fatigue mats. Reiloy USA contributed to this worthwhile effort and received several notes of thanks from the students. Here are a couple for you to read. 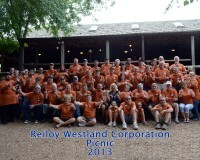 Reiloy USA’s Annual Employee Picnic was held September 19th. The weather could not have been nicer. 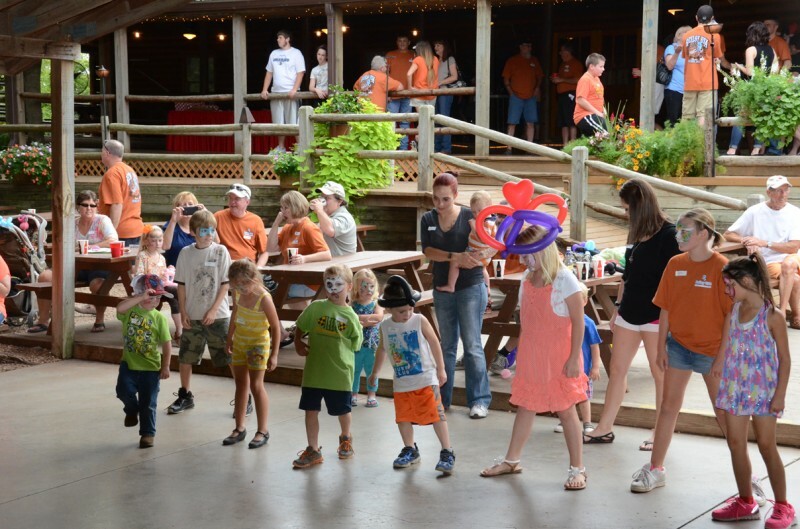 There were hula hoop and horseshoe contests, along with bingo, hayrides and of course great foot. All employees truly look forward to this fun event and appreciate the donated items for the drawings. What fun!! September found us ready to show off our new facility. It was a great day with many visitors touring through the offices and plant of Reiloy USA. A retirement recognition was held for Arlo Landreth who decided it was time to relax a bit. This company owes a lot to Arlo. He was the primary engineer on many of the machines used for years in our shop. In fact, he visualized and constructed most of them. His ingenuity proved to be an important part of our success today. Plus for all these years he has kept our machinery running in order to produce the quality screws and barrels for our customers. For this we salute Arlo and wish him many, many happy years of retirement. Pictured above are Marilyn (his wife), Arlo, Leta & Jeremy (Arlo’s daughter & son-in-law). By the way, Jeremy has over 30 years at Reiloy USA. As we said ... we owe a lot to Arlo! Kathy Hampton was recognized for 20 years of service at Reiloy Westland. There have been many changes over these past 20 years. Kathy originally started out typing quotes on a typewriter!! She has worked in several different areas during her time at Reiloy Westland and currently serves as the Director of Marketing. To commemorate this occasion, she was presented a plaque plus will receive a monetary gift to be used towards whatever she wants!! Kathy is shown with Dave Larson, Reiloy Westland’s President. Congratulations Kathy. We recently celebrated another 10 year employee anniversary. Norman Miller is our Senior Screw Mill Operator. Norman’s skills as a machinist are evident in the high quality screws manufactured here at Reiloy Westland. Thank you Norm ... for your continual commitment to a job well done. In recognition of this milestone, Norma was presented a watch by company President, Dave Larson. In December, Reiloy Westland presented two 20 Year Awards. Employee tenure is one of our greatest assets! That experience truly pays off in high quality components and customer service. 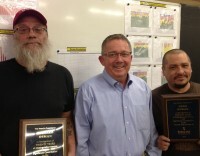 Pictured at left are Rick Osman, Maintenance; Dave Larson, President of Reiloy Westland; and Todd Duran, Polisher. We so appreciate the effort of all employees and truly enjoy getting to recognize their service! Thank you Rick and Todd. Reiloy Westland recognized four employee milestones during a company lunch in November. 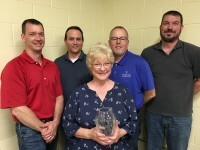 Pictured from left to right are: Luke Peterson, Shipping & Receiving 10 Year Award; Dan Johnson, Vice President Manufacturing 30 Year Award; Cindy Hogarth, Inside Sales Engineer 10 Year Award; Terry Hackney, CNC Machinist 20 Year Award; and Dave Larson, President of Reiloy Westland. This type of employee loyalty and commitment is what makes Reiloy Westland such a great company! Congratulations everyone!!! Even under cloudy skies, a good time was had by all at the recent Pittsburg State University Plastics Alumni Golf Tournament held October 10th at the Crestwood Country Club in Pittsburg, Kansas. Pictured above with some of the Pittsburg State cheerleaders are (l to r) Scott Badders w/ Robert Bosch; Ryan Leatherman w/ Pitt Plastics; Mike Thurman w/ Fabrik Molded Plastics; Justin Lumbley w/ Chevron Phillips and our own George Jansen, Reiloy Westland’s Regional Sales Manager. The weather for Reiloy Westland’s 17th Annual Employee Picnic could not have been better! We had a great turn out and everyone enjoyed the continual fun and delicious food. Thanks to the support of our wonderful vendors and manufacture representatives, everyone left with a nice gift! Troubles the Clown entertained with animal balloons for the children. And, our favorite DJ kept the activities moving seamlessly ... from hula-hoops, to bingo, to “Are You Smarter Than a 5th Grader” game to the hayride. Our President, Dave Larson, provided us with an overview of the improvements made this past year and then concluded with exciting announcements for the coming year. It was a great day and chance for all to meet and catch up on family and friends. Here are some scenes from this year’s event! 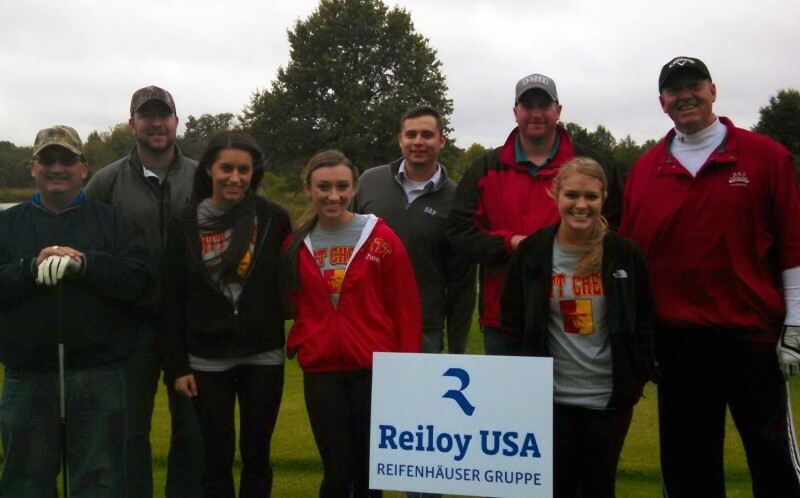 Mark Winter represented Reiloy Westland at the recent “Company Day” held September 24, 2014 at Pittsburg State University. 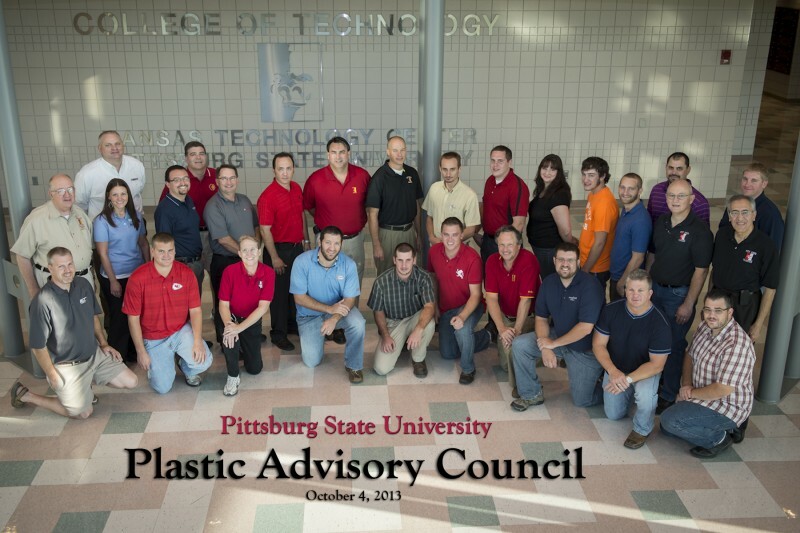 Mark was able to network with students studying for careers in the Plastics Industry. 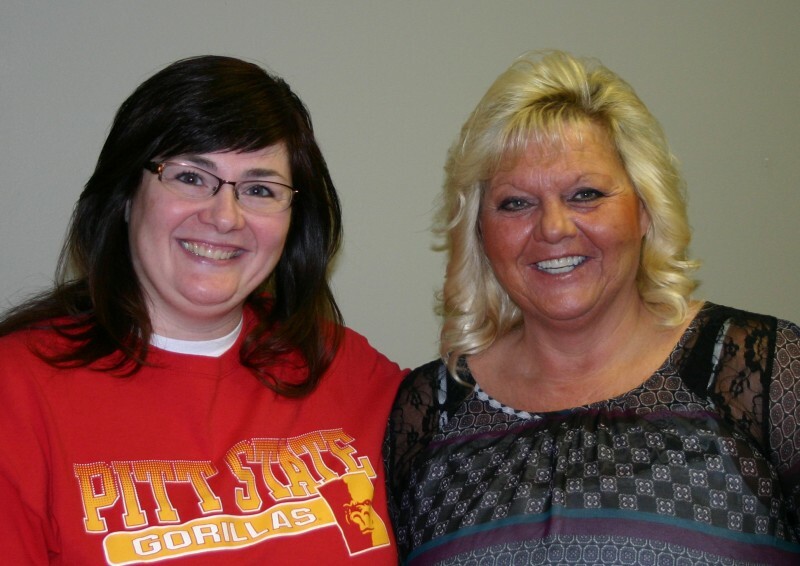 Reiloy Westland is happy to support Pittsburg State University and currently has two of their alumni on our staff. The “Big News” at Reiloy Westland today is the announcement that we are going to be moving into a new facility. Plans are already in the works to build a new building about 10 miles north of our present plant. We are excited about this news as we know it means everything will be state-of-the-art and positioned for the greatest efficiencies. Check back often to see our progress! Reiloy Westland recently celebrated an anniversary. Jeremy Brown has been a key contributor to our success for the past 30 years! In recognition of that milestone, Jeremy was awarded a gift of his choosing. Jeremy’s dedication and commitment to excellence is just one of the reasons Reiloy Westland can say “Our People Really Do Make The Difference”. His experience truly pays off in the quality product our customers have come to expect. Jeremy is now one of three employees who currently have 30 years or more. Thank you Jeremy! Jeremy is pictured above with company president, Dave Larson. It is always a pleasure to host representatives from our parent company – Reifenhäuser Gruppe – based in Troisdorf, Germany. Recently Zheng-Yong Yang, Director of Tax & Finance International, visited us for several days. “Yo” is shown above working with Reiloy Westland’s Controller – Kevin Mayer. March 7th is a day of mixed emotions here at Reiloy Westland Corporation. First we are celebrating the retirement of Debbie Larson. She is a busy lady since retiring but she did drop in today for us to show our appreciation. However, we are also sad today as we say goodbye to Michelle Brinkmeyer. Many of you know her as the person who answers our phones. She has done a tremendous job for Reiloy Westland in the three short years she has worked here. We will miss her enthusiasm and infectious laughter. Thank you both for a job well done. And, we wish you both the best in your new adventures. Michelle (on left) and Debbie (on right) are pictured above. Reiloy Westland Corporation was a proud sponsor of the Shrine Circus which recently made its way to Wichita. 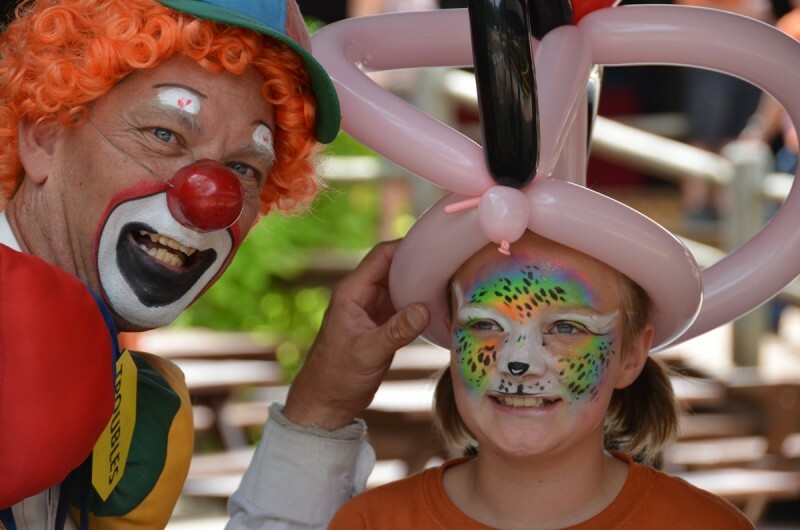 Through the generous donations of many area businesses, children of all ages had the opportunity to enjoy all the circus had to offer. 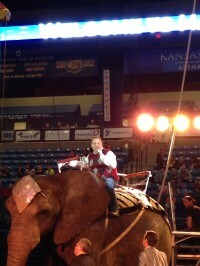 Our own Wayne Hook served as an honorary “Ring Master”. He did a great job and even managed to stay on the elephant that brought him in!! Thank you Wayne. The latest update in the Reiloy Westland Corporation’s plant centers around the screw polishing stations. Better lighting, new machines and improved exhaust systems have turned this area into a “state-of-the-art” operation. Winners of the horseshoe tournament at the Annual Reiloy Westland Employee Picnic were Luke Peterson (Shipping/Receiving, on the left) and Shawn Graves (Welder, on the right). Many teams participated in this year’s event, which is a favorite among our employees and families. 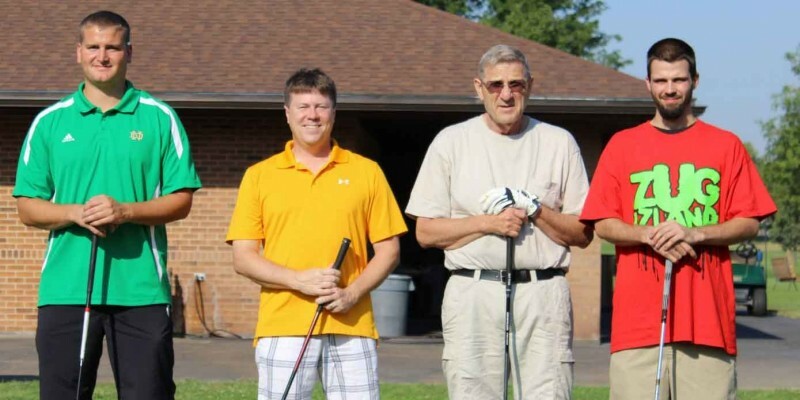 The winners of Reiloy Westland Corporation’s Annual Golf Tournament, held September 7th, were (shown left to right) Mark Winter (Programmer / Engineering Assistant); Tim Chesser (Regional Sales Manager / Senior Process Engineer); Bill Fisher (Maintenance Technician); and Derrick ﻿Gastineau (Cylinder Production). 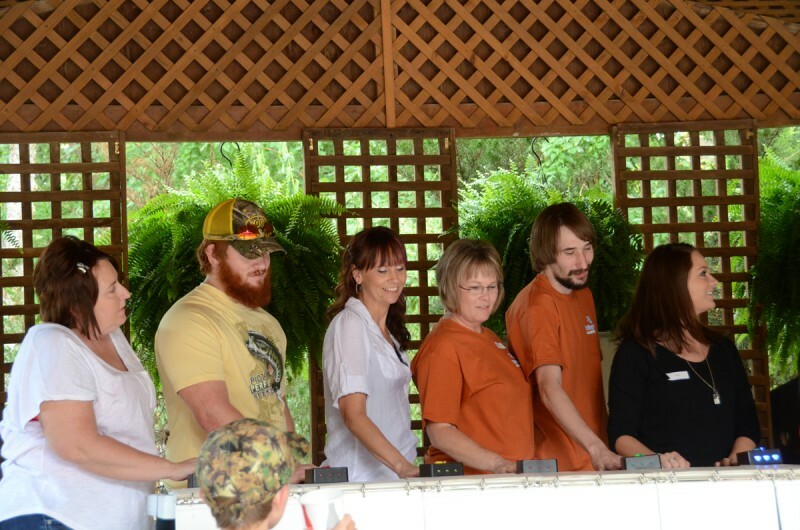 This group was recognized at our company picnic and presented prizes for their accomplishment. 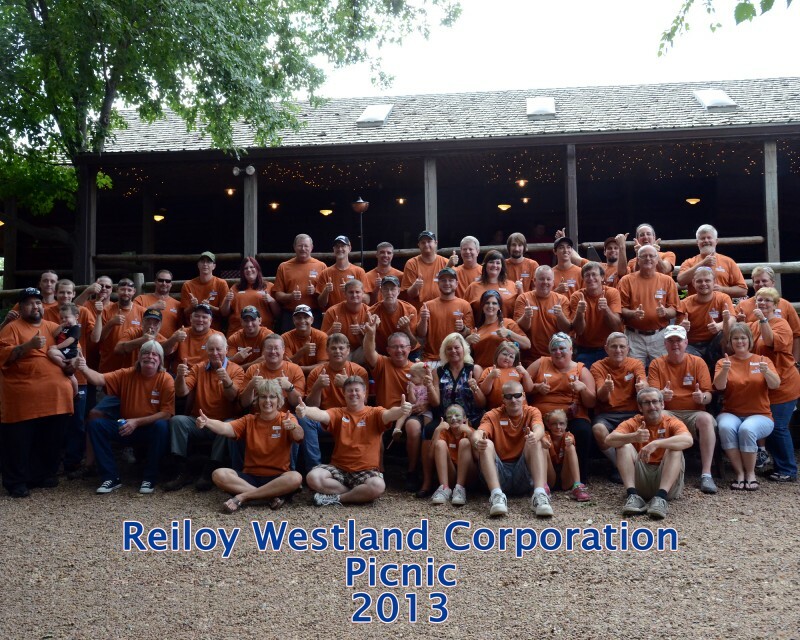 The Reiloy Westland 16th Annual Employee Picnic was held on September 15th, 2013 at Eberly Farms in Wichita. The weather was perfect and the attendance was great! The children are what make this event so fun. They all enjoyed dancing and playing the games the DJ provided. Troubles the clown also stopped by to make balloon toys plus many participated in the face painting. We can always count on good food and this year was no exception. The buffet line was outstanding and no one left hungry. The Reiloy Westland employees received many gifts generously provided by our vendors and representatives. We cannot thank you enough! Everyone had a great time and we are already anticipating next year. Here are some pictures from our event. Reiloy Westland recently had the honor of hosting the screw and barrel manufacturing experts from our sister company – Reiloy Metall GmbH located in Troisdorf, Germany. There is much to gain from sharing the knowledge and expertise both companies bring to the table. This is the first of many more collaborations that will take place in order to increase efficiencies in manufacturing the high performance, high quality screws and barrels our customers have come to expect on both continents. Show above, from left to right, are Ralf Pampus, Executive Assistant with the Reifenhauser Group; Jim Johnson – Director of CNC Programming & Applications Development for Reiloy Westland; then Christian Markowis and Gerhard Gremmer, representing the manufacturing and programming divisions of Reiloy Troisdorf. 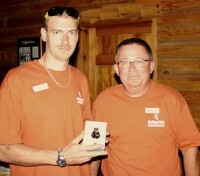 Shawn Graves was recognized for 10 years of service at the recent Reiloy Westland Annual Employee Picnic. Shawn has held several positions in manufacturing, most recently being our welder. Shawn’s commitment to quality work has certainly contributed to Reiloy Westland’s success these past 10 years. 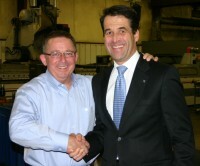 Shawn is shown here with Dave Larson, President of Reiloy Westland Corporation. Congratulations and thank you Shawn. Reiloy Westland recently took delivery on a new CNC lathe, adding to the already impressive list of upgraded machinery. These new additions, plus newly trained personnel and lean manufacturing implementations are providing Reiloy Westland customers shorter lead times. All efforts, from management to sales to engineering to production to support, are focused on being the best at building a quality product and providing excellent customer service. Shown in the picture at right, watching the progress of the unload, is Dan Johnson, Vice President over Manufacturing at Reiloy Westland. 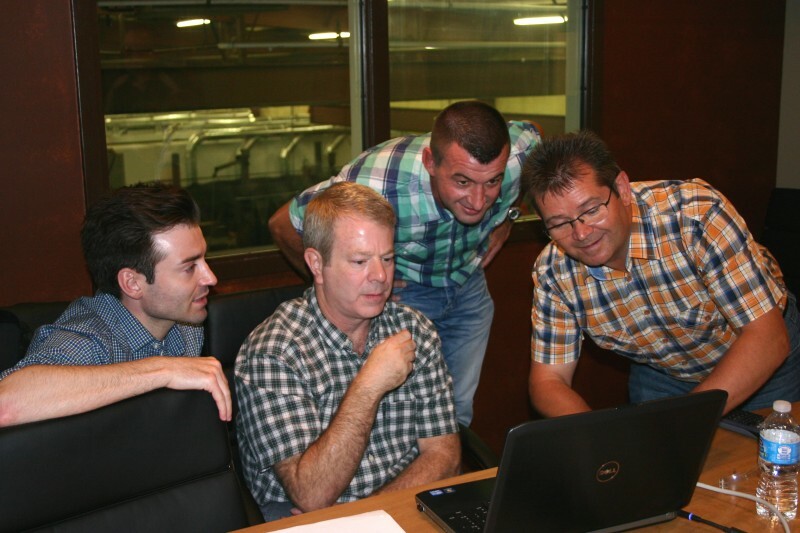 As Reiloy Westland continues to work hard to increase production, which in turn decreases delivery time, employees have been busy training on new equipment. With current average tenure at approximately 15 years, long-term employee knowledge, experience and expertise provides an added value to our customers. 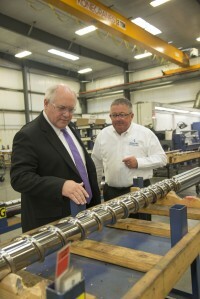 Shown running the new lathe is Vinton Brown, a 25 year employee with Reiloy Westland. Reiloy Westland was honored to have Mr. Bernd Reifenhauser, Mr. Thomas Porstner, Mr. Klaus Reifenhauser, and Mr. Zheng-Yong Yang visit our plant recently. Messrs. Reifenhauser and Mr. Yang are with our parent company Reifenhauser GmbH & Co. KG, and Mr. Porstner is Managing Director of Reiloy Westland’s business unit – Reiloy Metal GmbH, all located in Troisdorf, Germany. 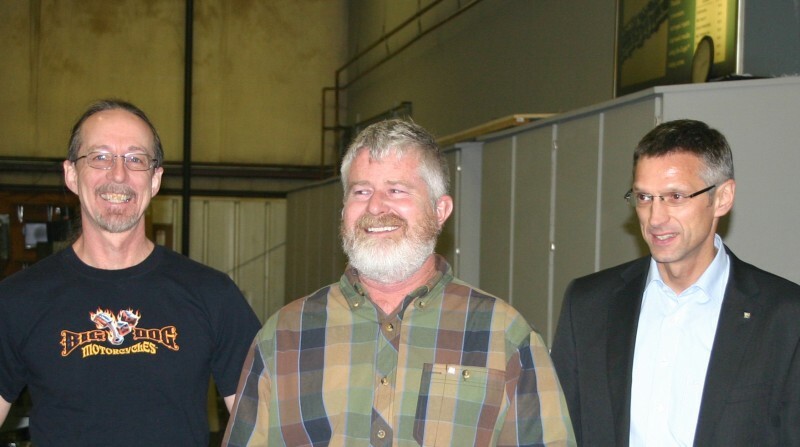 They are pictured at right with Terry Williams and Dave Larson of Reiloy Westland. Congratulations to Cliff Smith on 20 outstanding years with Reiloy Westland Corporation. Cliff is a CNC machinist working on manufacturing our high quality, high performance screws. It is experience like this that allows us to confidently state ... Reiloy Westland Employees make the difference. Our customers experience that difference in their production and profits! Thank you Cliff for being an employee we can depend on for skilled workmanship. 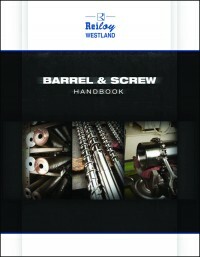 Reiloy Westland has published it’s 9th edition of the Barrel & Screw Handbook. Higher profits and better products don’t come easy to any manufacturer. It takes knowledge plus the commitment and means to apply it. 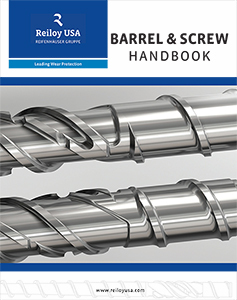 The Ninth Edition of Reiloy Westland’s Barrel & Screw Handbook is dedicated to providing that knowledge to processors in an easy to read and implement style. With today’s technological advances in both machine automation and resins, processors are faced with even greater demands in their quest for profitability. 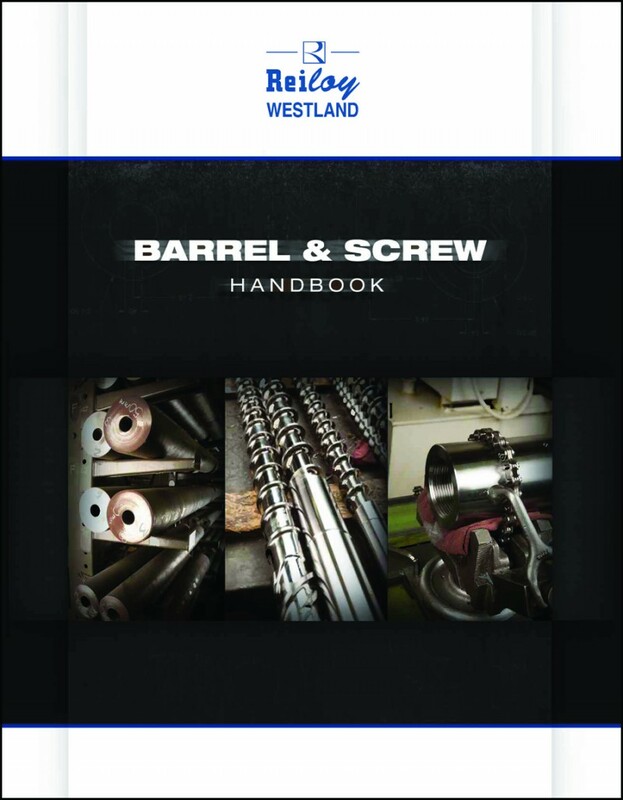 Reiloy Westland developed the Barrel & Screw Handbook as a means for processors to understand how the variables associated with these components can affect the overall process,â€ stated Dave Larson, President of Reiloy Westland Corporation. This 53 page Ninth Edition Barrel & Screw Handbook is offered free of charge and can be requested by clicking the following link or calling 800-247-1144. Congratulations to Rick Cotton on ten years of service to Reiloy Westland Corporation. Rick is pictured above between Dave Larson, President of Reiloy Westland (on the left) and Ralf Pampus, Executive Assistant with the Reifenhauser Group (on the right). Rick is a CNC machinist. His experience and attention to detail is one more reason our customers have come to rely on a quality product from Reiloy Westland. We appreciate your efforts Rick! During Rick’s presentation, Dave announced four other employee anniversaries this week. Combined ... those five employees equaled over 100 years of experience. This is just another example of how Reiloy Westland’s employees really do make the difference. Ralf Pampus will be working closely between Reiloy – Troisdorf and Reiloy – Westland to bring cohesion to our efforts in purchasing, engineering, manufacturing and sales. We are excited to be working with Ralf and look forward to him being in our plant many times during the coming months. Welcome Ralf! 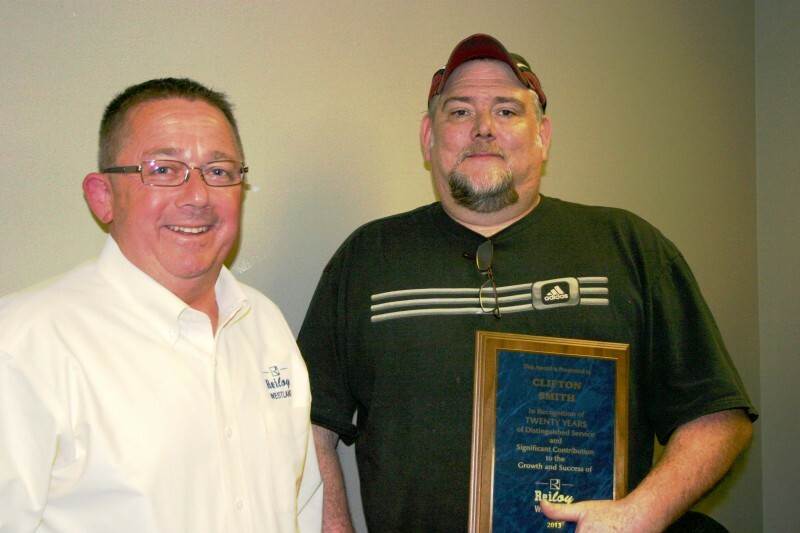 Dennis Fouse was recognized for 10 years of service to Reiloy Westland Corporation. Dennis is a design engineer. His attention to detail plus acquired knowledge of screw and barrel design has been a real asset to Reiloy Westland. Dennis received a watch in recognition of this milestone. Shown above are Dave Larson, President; Dennis; and Wayne Hook, IT & Engineering Director of Reiloy Westland Corporation. Westland Corporation is proud to announce that we have been acquired by the Reifenhauser Group, a 101-year old, family owned business based in Troisdorf Germany. Our new name is Reiloy Westland, and we will operate as an independent company within the Reiloy Business Unit. 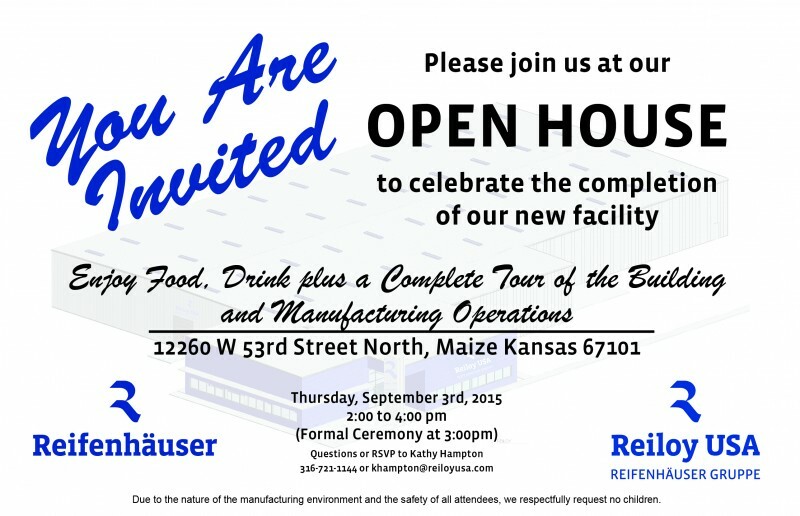 Representatives from the Reifenhauser Group and Reiloy Metall GmbH attended an open house celebrating this event at the Reiloy Westland Offices. Shown in the above photo, from left to right, are: Dipl.-Ing. Jurgen Hermanns, Sales Director of Reiloy Metall GmbH; Kosta Tsesmeles, Head of Engineering / Production at Reiloy Metall GmbH; Dave Larson, President of Reiloy Westland; Bernd Reifenhauser, Chief Executive Officer of Reifenhauser GmbH & Co. KG; and Thomas Porstner, Managing Director of Reiloy Metall GmbH and Head of the Business Unit Reiloy. Shown at left is Mr. Bernd Reifenhauser, CEO of Reifenhauser GmbH & Co., KG, addressing the Reiloy Westland employees. 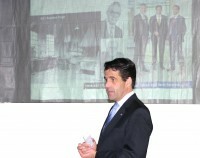 Mr. Reifenhauser explained the Reifenhauser Group business model and shared their corporate philosophy. Thomas Porstner, Managing Director of Reiloy Metall GmbH and Head of the Business Unit Reiloy chats with Tom Kramer, 1st shift Supervisor at Reiloy Westland. Charles Girrens, 2nd shift Supervisor at Reiloy Westland; Dan Johnson, Vice President of Manufacturing at Reiloy Westland; and Dipl.-Ing. Jurgen Hermanns, Sales Director at Reiloy Metall GmbH at the employee open house. Kosta Tsesmeles, Head of Engineering / Production at Reiloy Metall GmbH and Todd Duran, Screw Polisher at Reiloy Westland, enjoying the open house held in celebration of the recent acquisition. Dave Larson, President of Reiloy Westland – shaking the hand of Bernd Reifenhauser, Chief Executive Officer of Reifenhauser GmbH & Co. KG. The Reifenhauser Group acquired Westland Corporation, effective December 1, 2012.